On Sunday, September 18th 2011, I woke up at 6am to the cool chilly morning, wanting nothing more than to crawl back into a warm bed. Just because I love to race, doesn’t mean I wake up on race mornings feeling well rested or like running most of the time. Honestly, I often wake up feeling very little inspiration to run. 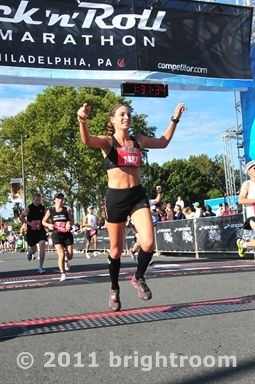 Though it never fails that by the time I cross the finish line, I am so happy I willed myself out of bed hours earlier. On this particular morning, I felt uneasy about what the race that lay before me would bring. I set out with the goal of running a 7:00 minute pace, which would beat my Queens Half Marathon back in July by 20 seconds per minute! It was a bold goal, especially since I hadn’t been focusing on speed as much as mileage lately. The pre-race minutes went by the way they normally do. Baggage was dropped off, porta-potties were visited, and Chris and I wished each other luck and headed to our respected corrals. I was in the first corral, as out of the 20,000 runners (16,000 finished) I was apparently one of the faster ones! Within the first mile of the race, a guy pulled up next to me and asked me what pace I was aiming to run. I answered that I was aiming for a 7:00 minute mile pace. Apparently he was aiming for the same pace, so we agreed to run together and pace each other. The miles clicked by, and I was thankful to have someone by my side as my focus began to shift around the 10K mark. My legs began feeling heavy and tired between miles 6-9, and a pep-talk from my running buddy helped me refocus. I began to get a second wind, and around mile 11 I was ready to pick up the pace and go “fishing.” “Fishing” is a term runners use as they slowly close in on runners in front of them a pass them in the final miles when most runners don’t have enough juice left to fight off the attack. To my surprise, right as we hit mile 11, my running buddy told me to go on without him. He had to pull back. I yelled behind me for him to “finish strong and push through,” and then I was off on a solo mission. I picked up the pace slowly, but held back until mile 12 to really plow forward. I have learned from experience to save the gas that’s left until the end, and not to jump the gun. Slowly but surely, after mile 12 I began passing runners. Male and female alike. There were a few male runners who fished me, while I was fishing others. In true signature form, I waited until the right moment (for a 13.1 race with an uphill end I waited until I was close to the 13 mile mark), I released the horses and flew past at least a dozen runners to the finish line. This strategy has become a racing habit for me, and a test of focus at the end. Sprinting to the finish and leaving everything I have left on the course, still running in good form and in complete control of my body and breath – it is perhaps the best feeling in the world. For a few seconds, I feel like a super hero. I crossed the finish line with a huge smile on my face, as I knew that not only had I achieved my goal pace, I had beaten it!!!! YES! I clicked my Garmin off, and walked with a smile to get my medal. I was surprised (and always am!) when fellow racers come over to chat with me after. A few men approached me individually, one had recognized me from behind from running in Central Park and NYRR Races. Apparently I’m often faster than him! Another man thanked me, as he was pacing himself on my pace and stride the entire race – without me knowing it! One runner said he admired my form. I often forget that in my corral and pace group, I’m in a man’s world. However, I was in the company of two NYC ladies who were part of Hellgate Runners and Van Cortland Bronx, respectfully. I made sure to beat them both while fishing at the end. I made it through the finish area, arms full of refreshments, then picked up my bag and made my way to wait for Chris at the family meeting area. A rock band played on the stage, and I stood in the sun, soaking up the warm rays as I was shivering in my sweat-drenched shorts and sports bra. It was a truly perfect race day in almost every way. The weather was perfect for racing, the course, was flat, and somehow my body once again rose to the challenge and met the task at hand. Now I am eager to run another Half this fall with new goal: 6:45 minute miles. All in all, there’s always room for improvement but it was a great race. I’m very happy with the end result. ~ by Elizabeth on September 20, 2011.